Looking for a lodger, How about a Walrus? Gumtree is a popular website which is commonly used by UK landlords to advertise for tenants and lodgers. But not all ads on Gumtree UK are what they seem or conventional in nature, and some are downright bizarre. Here is an example, which actually went viral last year, and has now been made into a $2.9m budget Hollywood movie Tusk, starring Jonny Depp. The ad first made the rounds online in 2013: a single older man living in Brighton was seeking a lodger… but only if that lodger was willing to dress as a walrus for up to two hours every day. According to the original ad, this was because he?d bonded with a walrus when living on St. Lawrence Island, Alaska. ?Hello, I am looking for a lodger in my house. I have had a long and interesting life and have now chosen Brighton as a location for my retirement. Among the many things I have done in my life is to spend three years alone on St. Lawrence Island. These were perhaps the most intense and fascinating years of my life, and I was kept in companionship with a walrus whom I named Gregory. Never have I had such a fulfilling friendship with anyone, human or otherwise, and upon leaving the island I was heartbroken for months. I now find myself in a large house overlooking Queens Park and am keen to get a lodger. This is a position I am prepared to offer for free (eg: no rent payable) on the fulfilment of some conditions. I have, over the last few months, been constructing a realistic walrus costume, which should fit most people of average proportions, and allow for full and easy movement in character. To take on the position as my lodger you must be prepared to wear the walrus suit for approximately two hours each day (in practice, this is not two hours every day ' I merely state it here so you are able to have a clear idea of the workload). With the exception of this, you will be free to do whatever you choose, and will have a spacious double room, complete run of the house (with the exception of my bedroom and my workshop), and use of all facilities within. I am a considerate person to share a house with, and other than playing the accordion my tastes are easy to accommodate. Due to the nature of this position I will need to audition all applicants before agreeing to take the chosen candidate on as a lodger. Please contact me if you have any questions.? Tusk the movie is an American horror 'dramedy' film written and directed by Kevin Smith. The film stars Michael Parks, Justin Long, Haley Joel Osment, Génesis Rodríguez, and Johnny Depp. The film had its world premiere at the Toronto International Film Festival, before it is released on September 19th. According to Kevin Smith “The idea for the movie came during the recording of SModcast 259, The Walrus and The Carpenter. By then, I?d stopped calling it The Walrus & the Carpenter. Before I wrote a single word, I knew what a movie about a walrus had to be called. I put the Fleetwood Mac classic Tusk on repeat and went to work. In two days, I had 40 pages.? 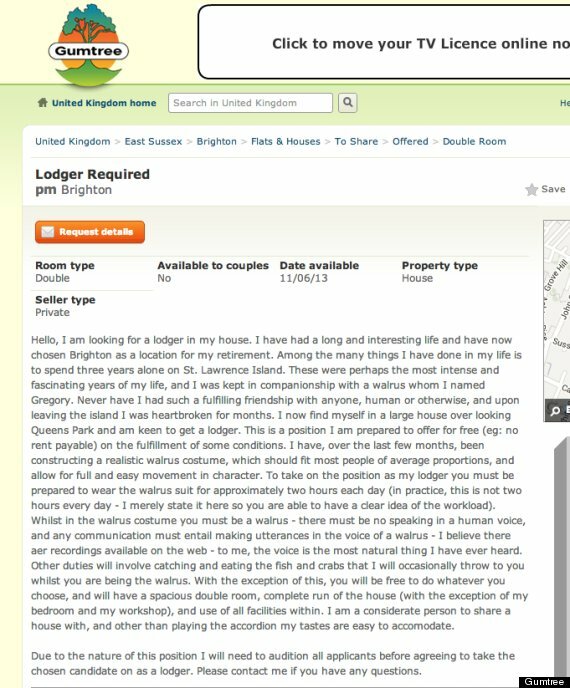 The original post on Gumtree UK was in fact a prank post by noted Brighton poet and prankster Chris Parkinson, a fan of Smith who then hoped he would get in touch with him so he could be involved in the film. Smith eventually hired Parkinson as an associate producer for the film.